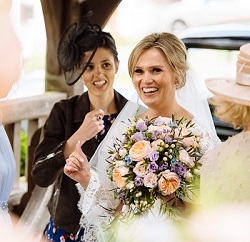 The brief for Sarah and Olly’s country, home wedding was very clear. 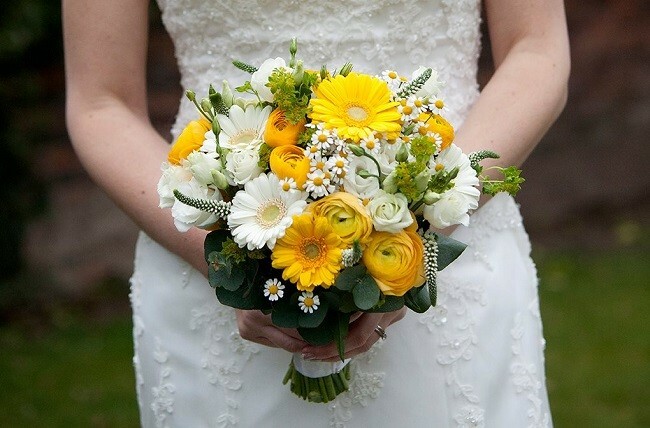 This is always helpful for a florist as it allowed us to get it just right for the couple. Sarah wanted my fave of all roses, the David Austin Juliet. 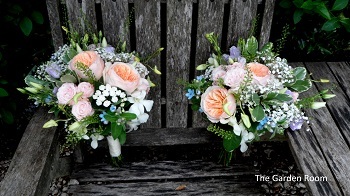 We put these together with blues and lilacs which you can see in the images. 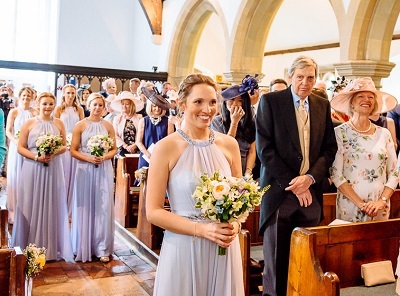 It was such a refreshing choice of colours and perfectly suited a May wedding. Sarah’s family have many friends in Thailand and they organised a huge shipment of dendrobium orchids for us. They arrived a couple of days before the wedding. Dear Henry was entrusted to transport all the orchids over to me but neither of us expected to see so many when we opened the boxes – there were hundreds of them! 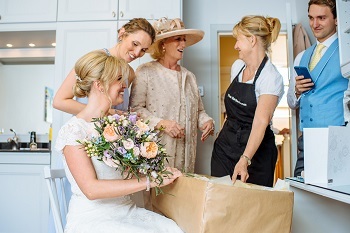 When I delivered the flower bouquets for her home wedding, Sarah was quite overcome and even her brother Henry had a tear in his eye! I love this moment the best of all. The flowers add the final dressing and the comments always thrill me. What can we say about Sarah? I first met her as a young shy girl in Barbados; my, has she changed since then! Very close to her family, she has become a confident, successful young lady and a key figure in the family business. 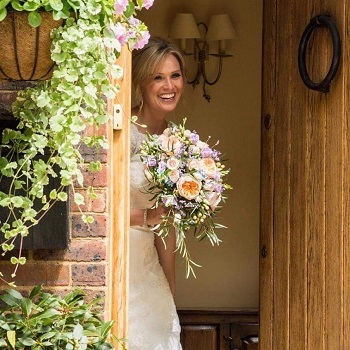 I became good friends with Sarah’s mum and dad several years ago and I was so surprised and chuffed to be asked to do Sarah’s wedding flowers. 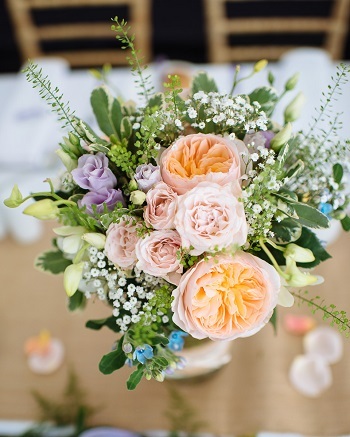 It might have had something to do with a flower conversation I had with Sarah on a ski lift once; when I get going talking about flowers, all my passion comes right through! 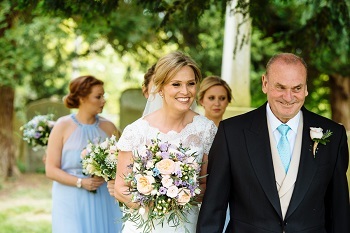 You can see below how proud Sarah’s dad was to lead Sarah towards the lovely 13th century Horne, St Mary the Virgin Church in Smallfield. 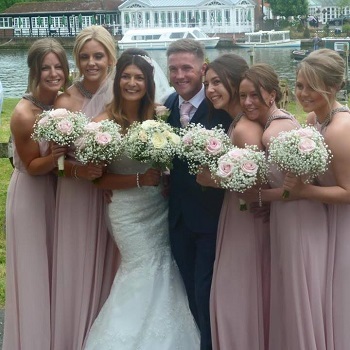 Someone else who was very proud was Sarah’s sister Lucy and followed below by all the other lovely bridesmaids. 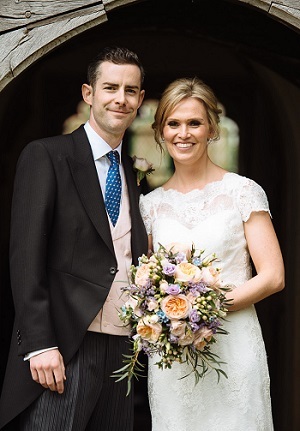 After the ceremony, all the guests arrived at Sarah’s lovely country home. 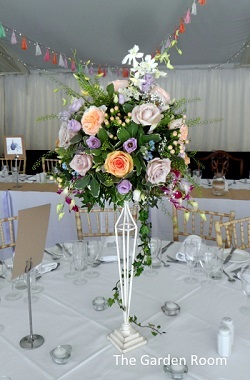 It had been transformed with a stunning marquee which we had been dressing all morning. 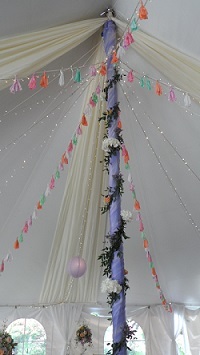 We climbed the highest ladders EVER to dress the central poles of the marquee with foliage, hydrangea and peach roses. Fortunately, a couple of the event guys started us off right at the top – it was almost “ship ahoy” up there! The gardens were also decorated with lights and lanterns for the evening. It looked positively magical! We think Sarah and her family did a magnificent job hanging lanterns and paper tassels to complete the decorations. You wouldn’t have know it was a home wedding. 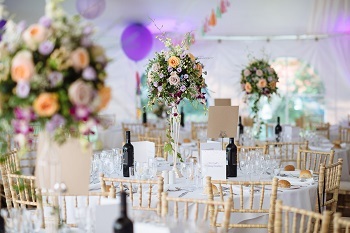 It was quite the prettiest marquee we’ve ever seen. Apparently the tassels took forever to make, but we think well worth the effort. 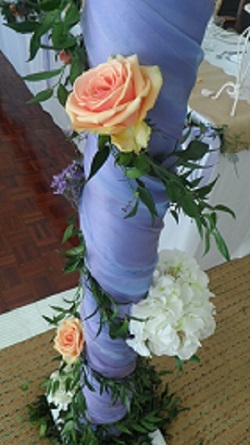 If you want to make decorations like these, get them done a few months before hand, otherwise it could put you under pressure as the wedding date draws near. (Etsy is also a great website to search for hand-made decorations.) For other ideas, see our inspiration page here. 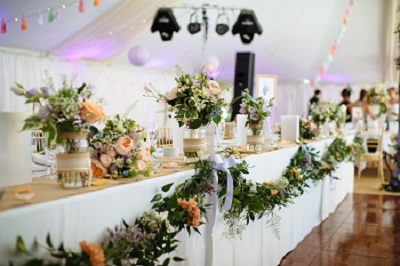 We made a lovely greenery and flower garland for the Top Table. 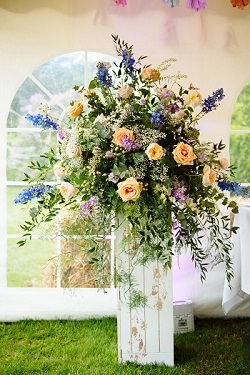 This was offset by our lace and hessian trimmed jars filled with flowers that sat along the front on a hessian table runner. 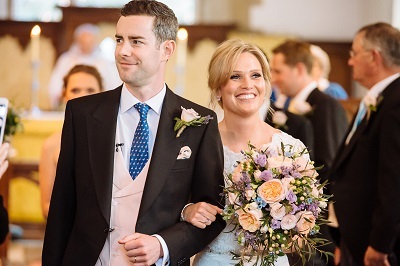 Sarah and Olly made such a beautiful couple and we were so proud to have been asked to do the flowers and decorations. Thank you!